March into Spring. Time for everything to wake up and shine! 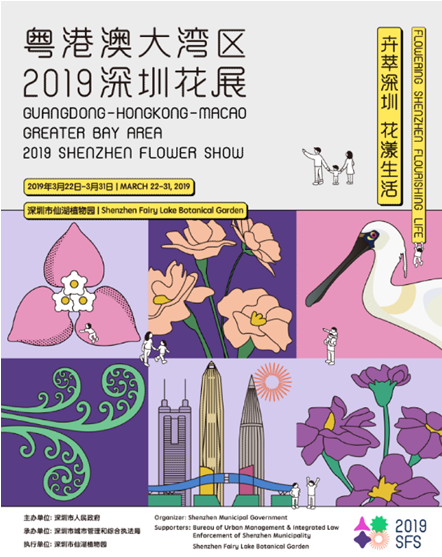 The First International Shenzhen Flower Show will be held at the Fairy Lake Botanical Garden (FLBG) from March 22nd to the 31st, 2019. The theme of the Flower Show is Flowering Shenzhen, Flourishing Life, and the theme flower, Matthiala incana, symbolizes eternal love and beauty. More than 20 well-known horticulture and landscape companies from home and abroad will participate in this show. In total, 786 new varieties of ornamental plants and more than 130,000 pots of flowers will be displayed, and even a new rose hybrid will be unveiled during the flower show. You can get a close look at 5 foreign gardens created by internationally renowned masters; observe the floral displays of several top domestic and foreign florists; walk along the flower borders built by 13 well known, domestic garden companies; stroll across 11 elite gardens which are carefully designed and constructed, using green, hi-tech concepts for various districts of the city; enjoy the container garden exhibition and the creative gardens produced by young designers. At the same time, you can also admire the precious Gesneriaceae collection which has been conserved by FLBG for years. Plus, more than 10 unique landscape nodes starting with the the main entrance of the botanical garden and connecting to different and more enchanting gardens. Various activities are also interspersed throughout the show, including The Guangdong-Hong Kong-Macao Greater Bay Area Flower City Construction Forum, 2019 Shenzhen Flower Industry Forum, 2019 The Guangdong-Hong Kong-Macao Greater Bay Area Floral Arrangement Competition, Children's Painting Show, music and culture performances, a nature education carnival and more. The 2019 Shenzhen Flower Show invites you to visit!